Tyra Fennell is the founding director of Imprint.City, an organization seeking to activate industrial, underutilized spaces with art projects, encouraging community and economic development. Imprint.City is working to build the Bayview Hunters Point neighborhood as the emerging arts district of San Francisco by adding to the already rich, arts tapestry of the neighborhood. Since its formation, Imprint.City has launched several high profile arts projects to leverage the talent in the community as well as celebrity such as Van Jones as well as strategic partnerships including the American Conservatory Theater, PG&E, Five Point and Airb&B. The Bayview Harvest for example, dovetailed access to a fresh produce for residents with arts engagement. Imprint.City created Bayview SPARC in partnership with Shipyard artists, the Flaming Lotus Girls. SPARC introduced the neighborhood to Burning Man and its youth to science by having them participate with engineers to build the featured Tesla Coils showcased during the event. Under Tyra’s leadership, there has also been beautification projects developed in the community, which includea light installation at the 3rd Street Gallery, a space Imprint.City developed this project in partnership with local curator Danielle Satinover, the Bayview Opera House and Andrea Baker Consulting. The 3rd Street Gallery is comprised of once vacant spaces on Third Street between McKinnon and Oakdale that were transformed into an arts and culture hub for the neighborhood use. In 2016, Imprint. City also launched the first annual Bayview LIVE Music and Arts Festival located on Egbert Street between Third and Jennings Street. BayviewLIVE is an annual event created to highlight the beauty of performing and visual arts, reflecting the cultural landscape of the neighborhood while also encouraging the patronage of local businesses by event goers. The Festival serves as a mechanism to raise tech education awareness and resources for Bayview youth to attend coding workshops, leveraging a partnership with Mission Bit, an organization strengthening the tech education pipeline for minority students. In 2016, the BayviewLIVE Festival attracted over 2,000 attendees and featured Grammy nominated artist, Jidenna. The birth of the SPRAYVIEW arts district, quietly launched during the 2016 BayviewLIVE Festival. The Sprayview will grow to be an outdoor museum between the parameters of Yosemite and Egbert Avenue between Third and Ingalls Street in the Bayview Hunters Point. The beginning of this 5-8-year project curated by muralist Cameron Moberg can be seen on Egbert Avenue between Third and Jennings Street. The SPRAYVIEW will include more that large scale murals; we will be working with urban planners to build infrastructure that will include branding structures and signage as well as building support and organizing the merchants within the parameters of the project. In addition to her work with Imprint.City, Tyra also serves on the board of Bayview Community Legal and is the past chair of the Bayview YMCA. 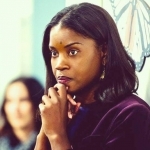 She is the chair of the arts and culture committee for the Bayview Alliance, spearheaded by philanthropist Roselyne "Cissie” Swig and is a member of Leader Nancy Pelosi’s African American Roundtable, San Francisco Assemblyman David Chiu’s Women’s Committee and is an Emerge California Fellow. Ms. Fennell is also a resident of the Bayview Hunters Point and a Howard University graduate.